Writing out a weekly diet meal plan can help you go far toward your weight loss goals. Follow these dieting tips and tricks for making this plan work for your active lifestyle. A weekly diet meal plan is really no different from a daily plan, except it allows you to plan your meals and snacks further in advance. For many individuals, this actually allows them the flexibility to finally succeed where other diet meal plans have failed. Here are a few benefits of following a weekly diet plan. You get to see the big picture very clearly. 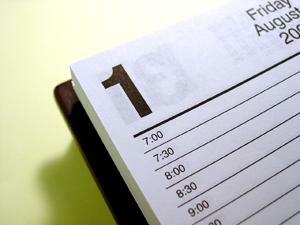 Instead of stressing over the small details, a weekly plan forces you to look at the week as a whole. If you have an event you know will include a lot of "bad" foods, plan to eat a better diet the day before and after. It takes the guesswork out of eating. If your eating plan is already done for the week, you don't have to stand in front of the refrigerator wondering what to eat. Planning is essential to dieting success. Creating a weekly diet meal plan is the ultimate in diet planning. You know what they say, "If you fail to plan, plan to fail." It allows you to make use of leftovers and other foods in your pantry. By planning in advance, you can plan to serve leftovers for next-day lunches or quick dinners. This can help stretch your dollar and your time. If you would like to begin following a plan like this, consider the following tips and tricks. Write it out. Most people are better able to see a plan through to fruition if they write down their goals. Dedicate a notebook or computer spreadsheet to your weekly plan and review it often. Get organized. Rearrange your pantry to make it easier to prepare quick meals. Organize your refrigerator so items you'll need earlier in the week are nearer the front. Use labels. If you plan to prepare lunches for your children or yourself in advance, you can label them with names or days. This can make getting out the door in the morning quicker and simpler for everyone involved. Use a calendar. If you're trying to lose weight or just want some level of accountability, try using a wall or desk calendar to record your meals or goals. This can serve as a regular visual reminder when you feel challenged to stick to your plan. Request backup. Do not ever underestimate the importance of a support structure made up of well-meaning friends and family when it comes to reaching your goals. If they aren't game to join you in your goal, ask someone close to you to help keep you accountable. This can be as simple as a daily email reminder or phone call. A healthy balanced diet should include exercise and a variety of whole foods that taste good and are good for your body. Here are a few quick reminders when it comes time to develop your plan. Include a vast array of fruits and vegetables. Colorful fruits and vegetables are also full of vitamins and minerals. Lean proteins will give you the biggest bang for your caloric buck, so stick with egg whites, poultry, fish, dairy, and legumes for the bulk of your protein. Limit sweets and salty foods as some believe they have a tendency to be addictive, are highly caloric, and can cause you to retain water. Drink plenty of water. Water is truly the basis of any healthy diet. For more tips and advice on healthy eating plans, visit a registered dietician or certified nutrition expert.